In the past I have not been a fan of garage sales. Most of my experiences have been pretty bad. I blame it on false Craigslist advertising, but who is policing that? It's not like there's a way to rate garage sales based on how accurate their ad was. 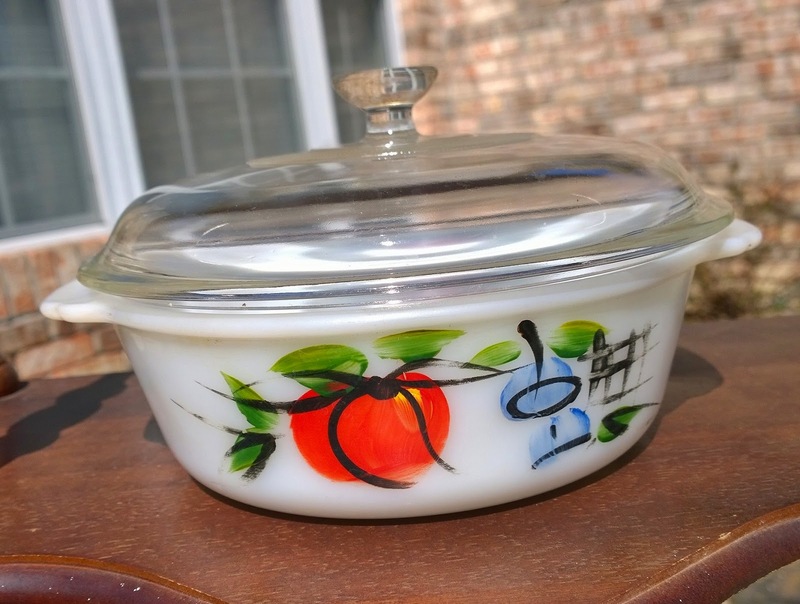 People who were selling baby crap and used dollar store tupperware would throw in the words, antiques, vintage, collectibles, retro, etc etc to get people like me to bite. What it really makes me want to do is to curse you for your false advertising. But, most of the times I walk halfway up a driveway and then turn right back around. This is where pictures would nice and helpful. 10 times out of 10 (yes, that is a scientific, researched fact :-P) if you have pictures that match your description and I see a few things I like, I will add you to my garage sale list. Well, something has changed this garage sale season. People are getting a lot better at their descriptions. Except in the case of the ad that only boasted "Winne the Pooh and Coke collectibles" and I ended up with 25 amazing vintage suitcases. But, that's an exception to the rule that I'm willing to accept. 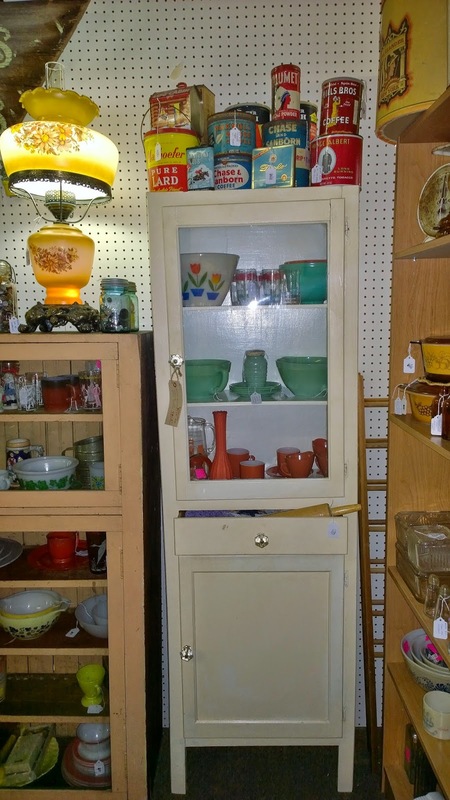 A green folding bar cart! FOLDING! It's pretty darn cool. 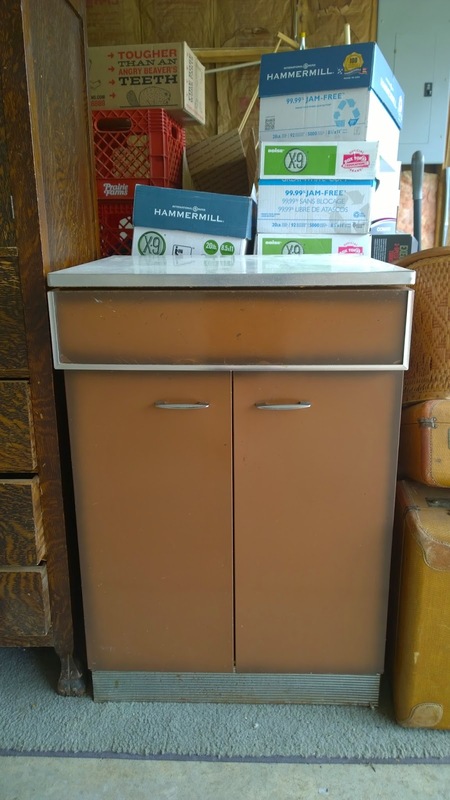 It's a little rusty, but someone will love to sand that off and spray paint it a new bright color. 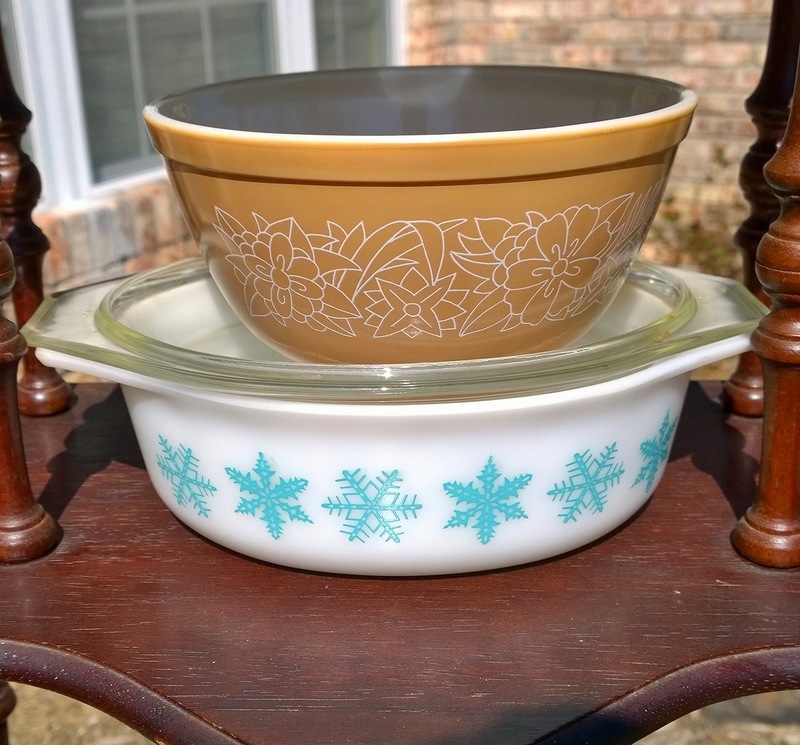 I only bought a few pieces of Pyrex. The rest were Early American, which I don't usually buy, unless it's a full set. My first aqua fridgie in the wild!! 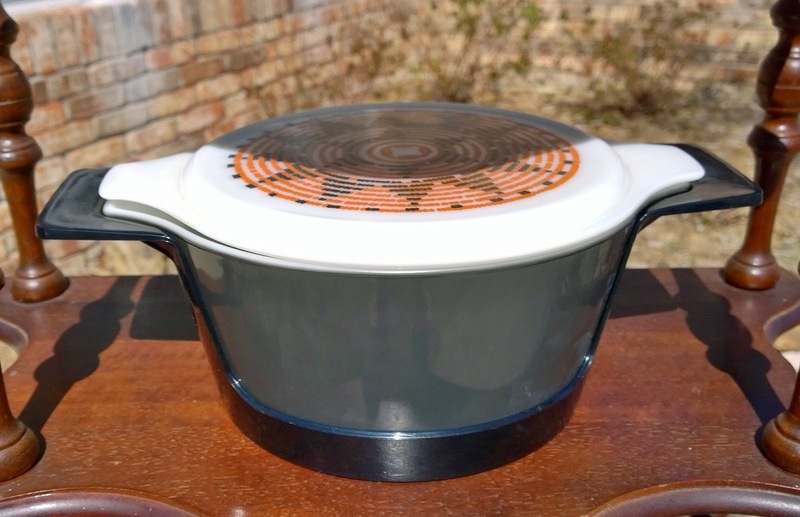 And this snowflake roaster is huge. 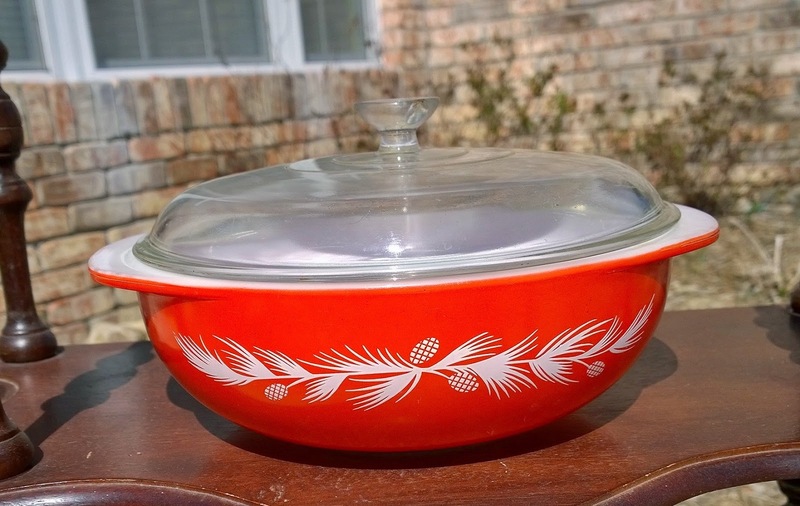 I bought this Westinghouse loaf pan because I love the lid. Plus it looked like it had never been used. The little Santa is Lefton. 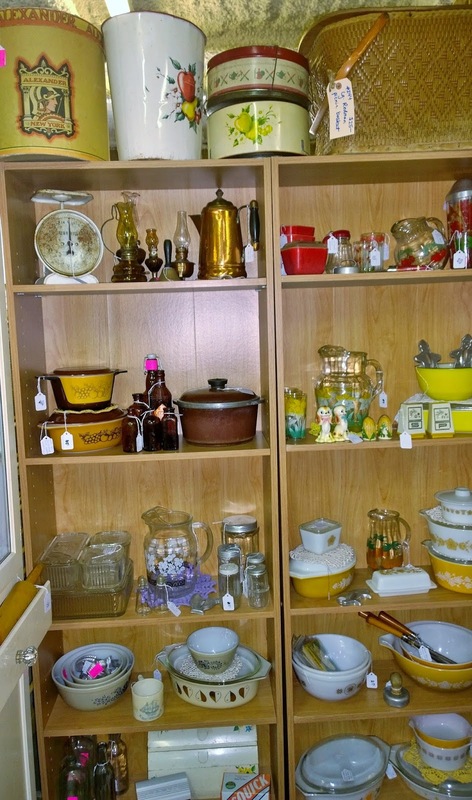 There's various kitchen tools (including Bakelite tongs) and cookie cutters. 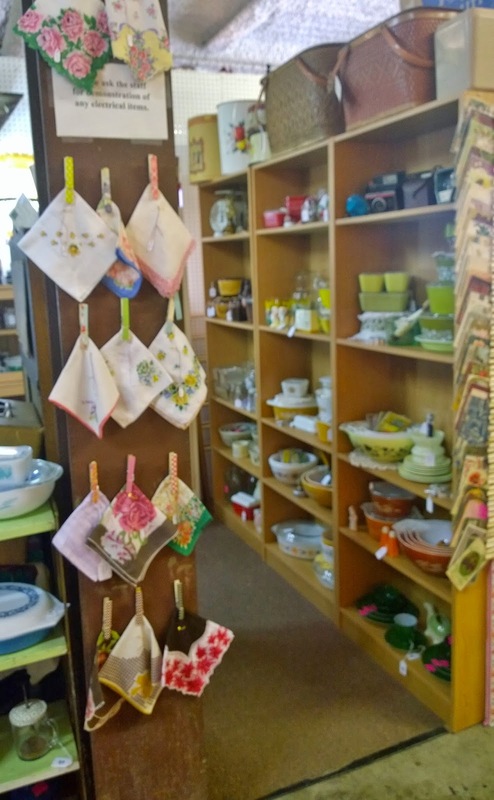 Bellow are some hankies and vintage boxes of candles, hangers, and Angel Chimes (which I have bought and sold before). So, here's where I want to say thank you to all the peoples' garage sales that I stopped at, since you all so accurately described your stuff! I also appreciate that many of the sales I had on my list were part of neighborhood sales, so I was able to hit a few extra homes. One had a pretty big pay off, too. 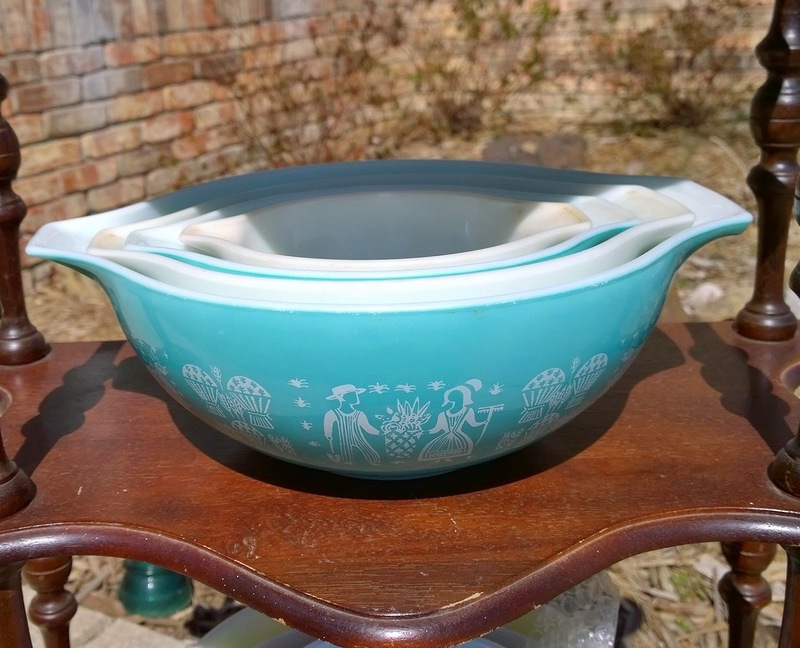 Starting at the top: an aqua Colonial band Fire King bowl, pink stoneware (McCoy?) 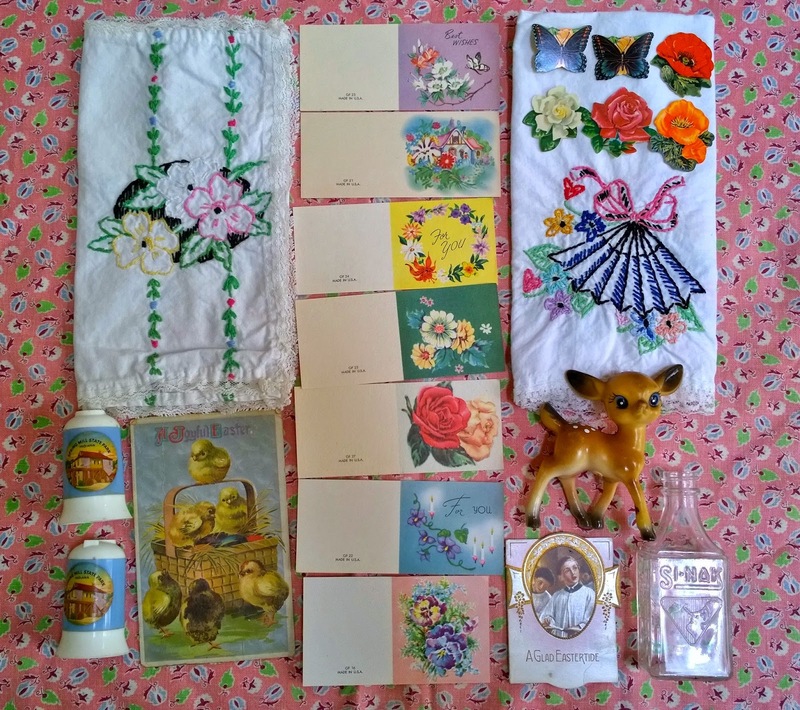 bowl, 2 West Germany Easter egg candy holders, 3 milk glass plates, a milk glass Nar-o-Fold napkin holder, a child's hankie, Made in Japan elephant figurine, plastic doilies, and LOTS of paper shelf liner - some in the original package. 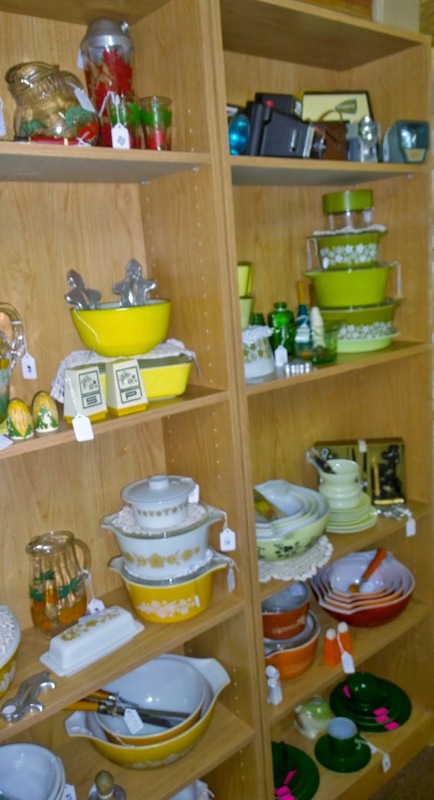 Starting at the top: 3 pieces of Pyrex (Early American - I know, but SO CHEAP, Spring Blossom, and Crazy Daisy), McCoy smiley face mug, so many milk glass vases (I have been collecting these for several brides-to-be), 4 Hazel Atlas moderntone sherberts, 4 santa face mugs, more children's hankies, a chenille baby's blanket, a table cloth, and the beautiful table cloth covering the table! 17 aqua blue Ball jars. How could I pass them up? 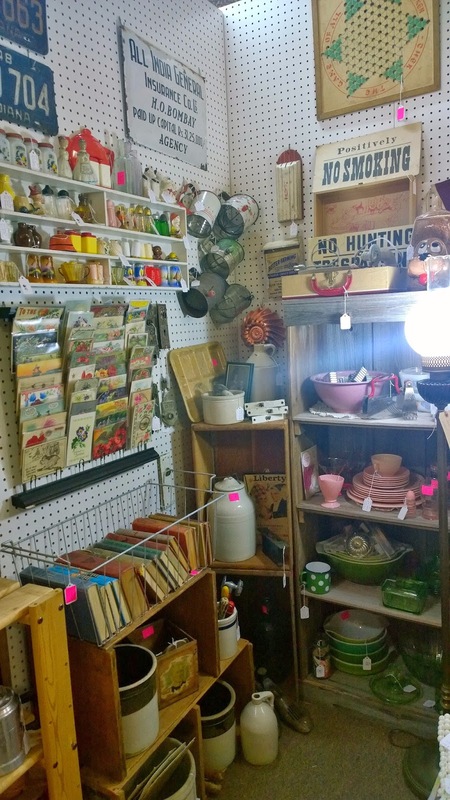 A wood silverware tray, red telephone, Androck nut grinder, 2 rusty cheese graters, and a red handled rolling pin. A wood (the guy said walnut) box with Bakelite handle and three (YES, THREE!!!!) scales. 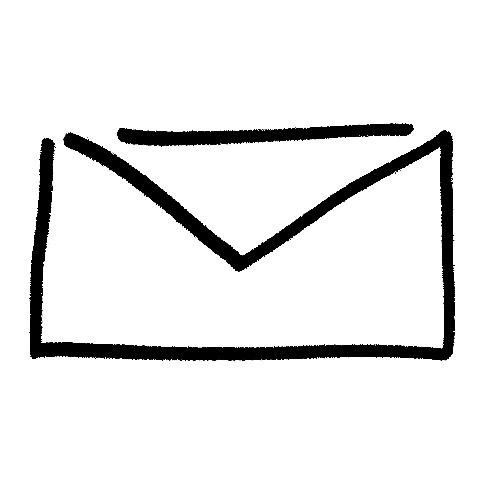 The small postal scale actually came from a local company: Indianapolis Power and Light, which is still operating under that name today. 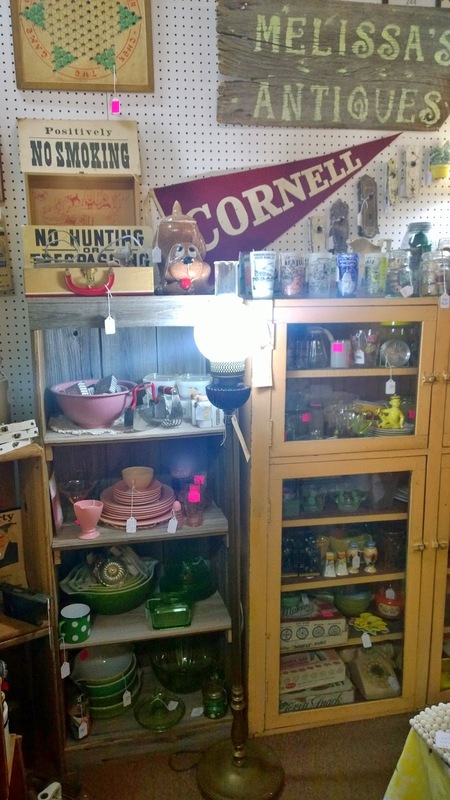 2 small crocks, a minnow bucket, and a little wood cabinet with glass shelves. 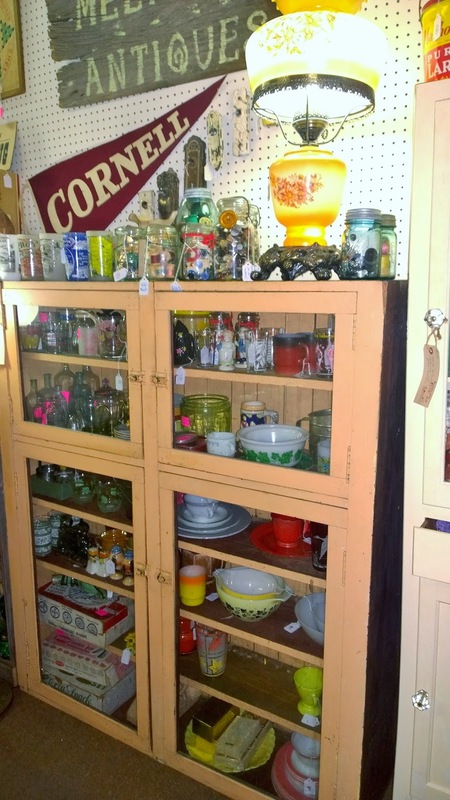 The cabinet was made from pieces of an old fruit crate. It's marked 1980 on the back, but I don't care. I think these little details really make it special. A stack of pretty linens for one price. I can never turn that down. EVER. I think it's physically impossible. And this box of made in Poland ornaments. Lots and lots of (mostly) children's books. A lot of these were military themed and they are now part of the May military themed window display at my antique mall. Last, but not least, these sweet wood folding chairs. They're still pretty sturdy! 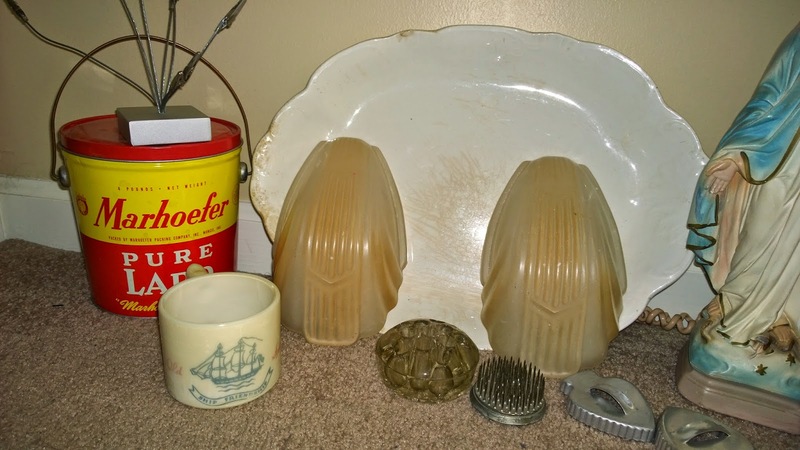 And a just because little collage of my weekend finds. 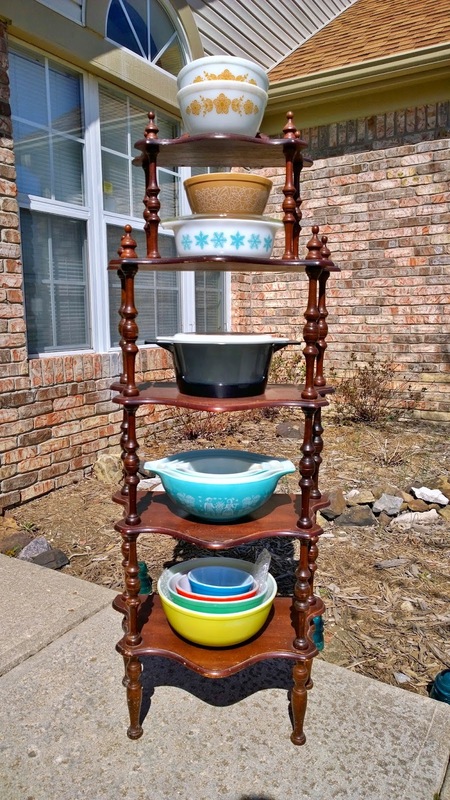 So, if the point of this post wasn't clear: I am really starting to get into this whole garage sale thing. And I'm happy that the sales haven't been as disappointing as they have been in years past. 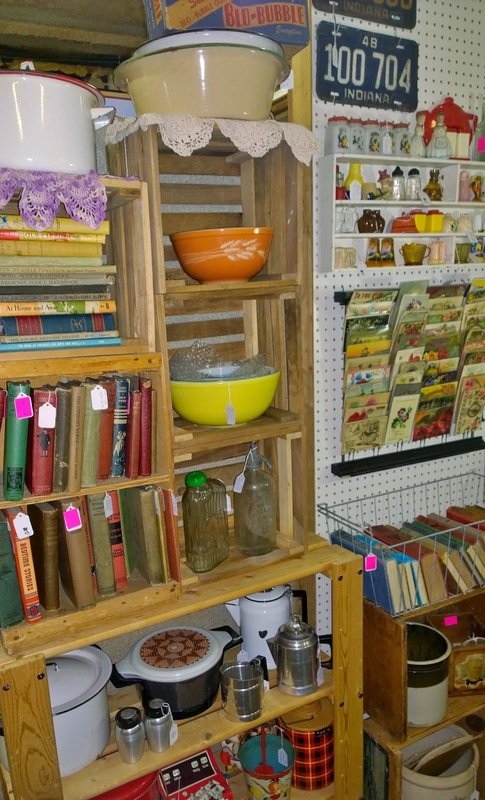 What are your thoughts on the garage sales in your area? Love 'em? Hate 'em? Not enough of 'em? Speaking of garage sales, mom and I are hitting the annual State Road 38 Garage Sale this weekend. 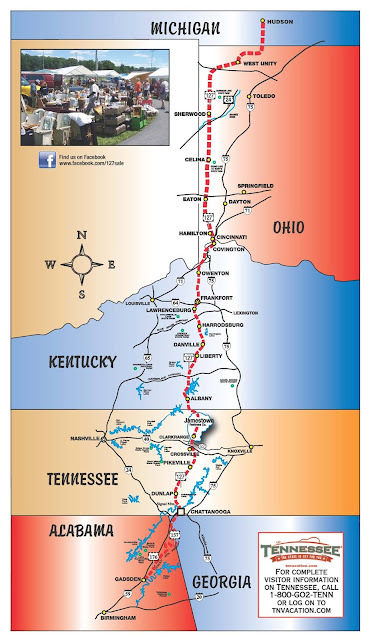 It is about 40 miles of highway from Noblesville to Hagerstown, Indiana. I've never done this route before, so I'm looking forward to what I might be able to find. 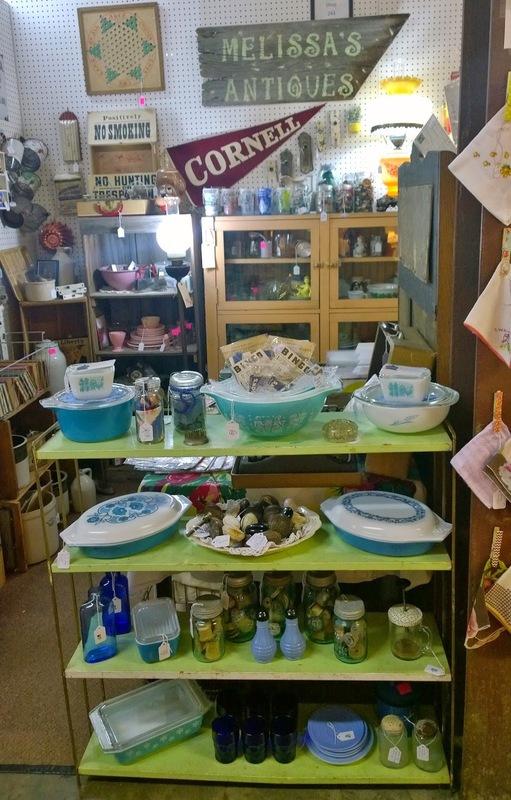 Later in May me, mom, and her sister will be tackling a portion of the US 40/Historic National Rd Garage Sale. I've got to start planning our route for this. We'll be going for either 2 or 3 days. Anyone with experience know great towns to visit along US 40 in Illinois, Indiana, or Ohio? **FYI - I had to turn the word verification back on for the comments. Apparently spammers loved me enough to start leaving 3-5 comments per post. Sorry if this is annoying and I hope you'll still leave comments for me to read! 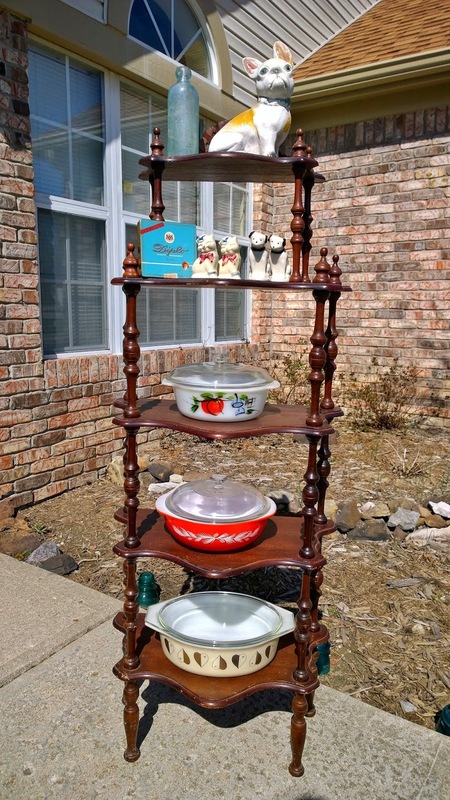 I had a feeling that spring had truly sprung the weekend that garage sales really started to pop up and I brought home that truck load of suitcases. (Seriously, I still can't believe it!) 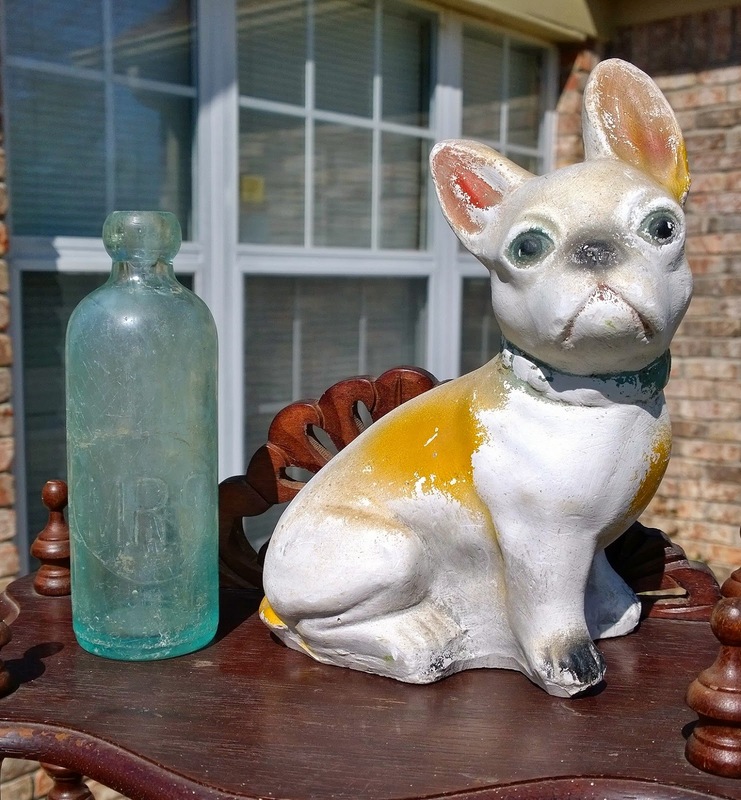 But, it really hit me Saturday when I attended my first outdoor onsite auction. These are my ABSOLUTE favorite type of auction. 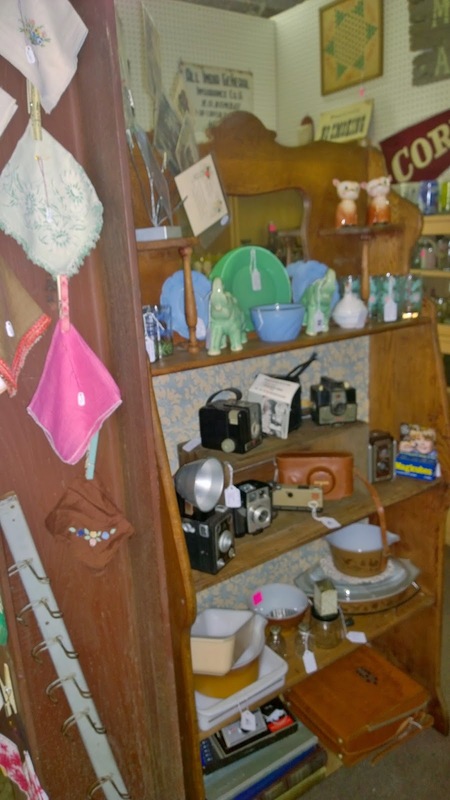 I know it sounds nosy, but I like visiting old farms and getting to peek around at what was once someone's life. 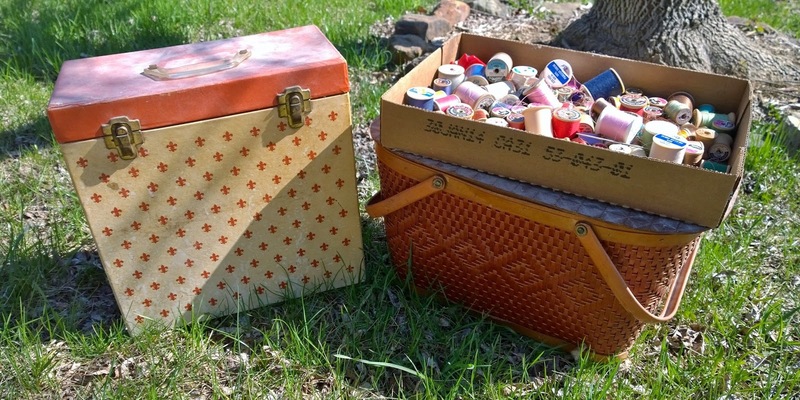 It's especially neat if it's chalk full of antiques. These onsite auctions aren't always old farms with places to peek around, sometimes they're small in-town bungalows. Either way - still interesting. So, let me show you what I brought home... Again, if you follow me on Facebook, you've already seen these. These ended up looking pretty good once cleaned up. 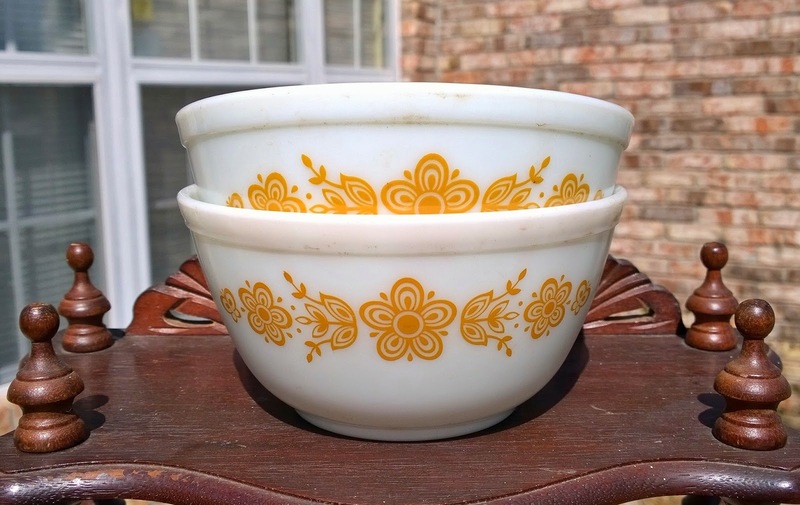 These must've been the everyday, workhorse bowls. I think the layer of dirt turned a lot of people off from this set. are absolutely MINT CONDITION. I was pretty ecstatic. Woodland 402 and Snowflake 043... also mint condition. Golden Hearts promo that I debating keeping. Great size. open to trades or paying for it! 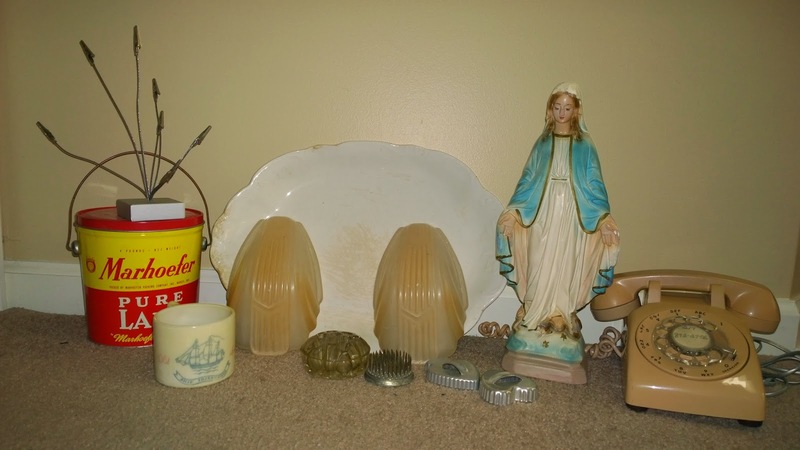 These are the 2 finds I will actually be keeping! chalkware doggie! What shall I name him? and lots of wooden spools. Thanks for taking a stroll through my booth! I am obsessed with Gurley candles... and when I won this lot for an amazing price... I was super excited. I considered taking them to the booth.... but Easter is Sunday... so they can wait until next year! 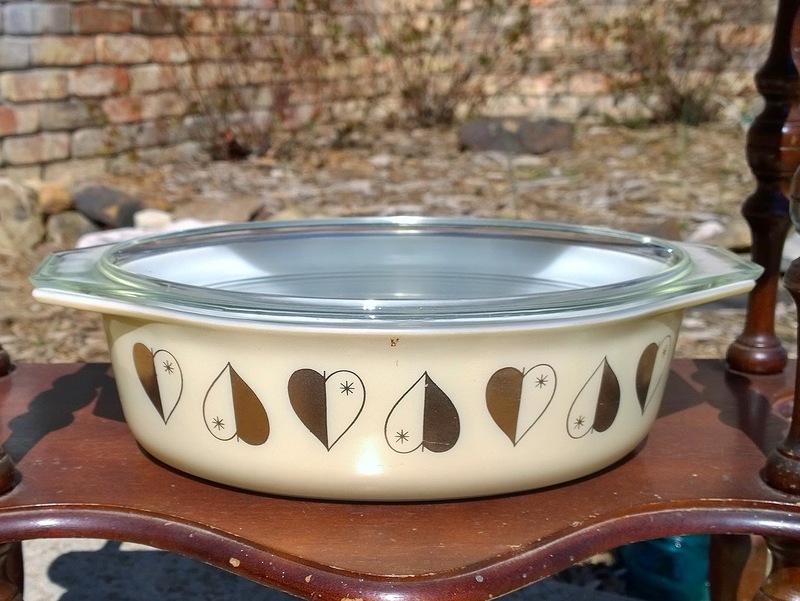 I also really love Meyercord decals. I won these 2 lots of them with free shipping... so how ever could I say no?? These will more than likely head to the booth with the exception of a few... I have some ideas in mind. 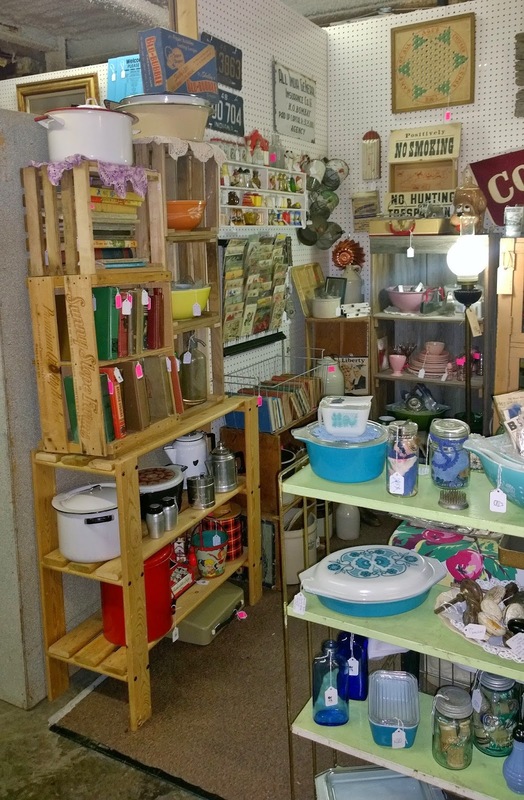 I've got junkin' plans for this Saturday... so hopefully I can bring some more good stuff home. Maybe some folks will stay home or be traveling for the holiday. One can hope, right? I was thinking to myself earlier this week, how will I ever be able to top last week's ridiculous suitcase haul? 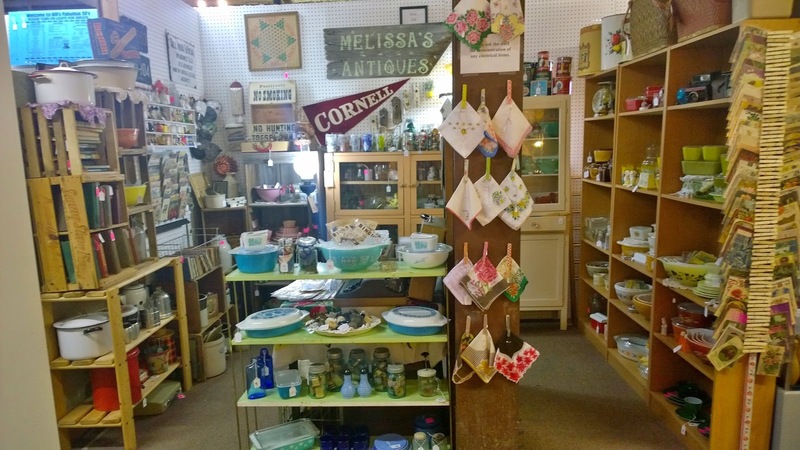 Thanks Amy for featuring my haul... and the many others of you who shared my pictures from my facebook page... there are too many of you to list, but know that it is always appreciated. The garage sales were still few and far between. I came out of a couple empty-handed. I am convinced that the more poorly worded your garage sale ad is, the more likely I'm going to score some GOOD JUNK. So, let's see what I picked up this weekend. 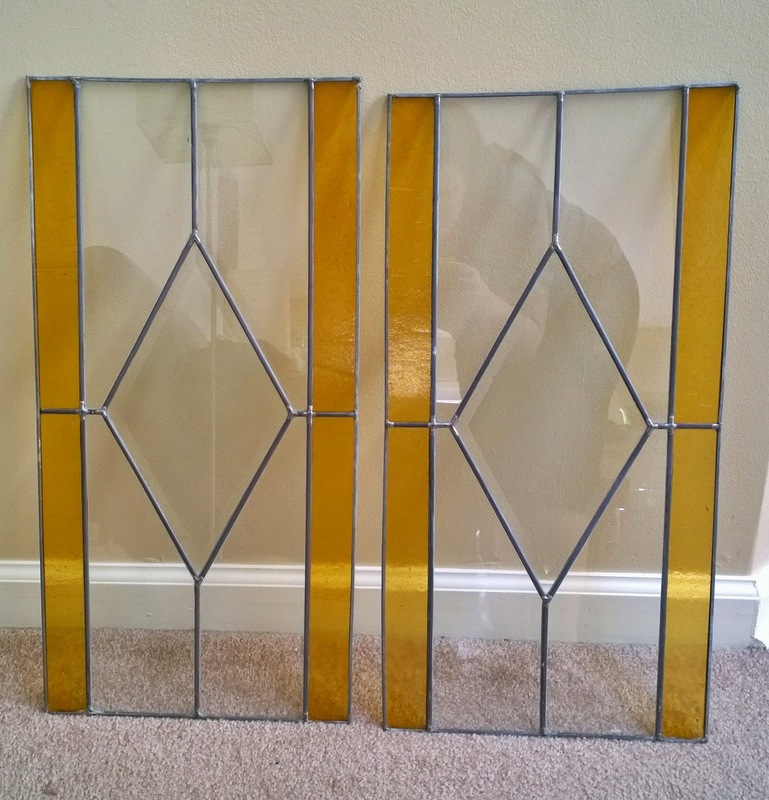 Simple, but beautiful stained-glass windows that they had saved from a house long, long ago. These were the rest of the non-holiday finds. 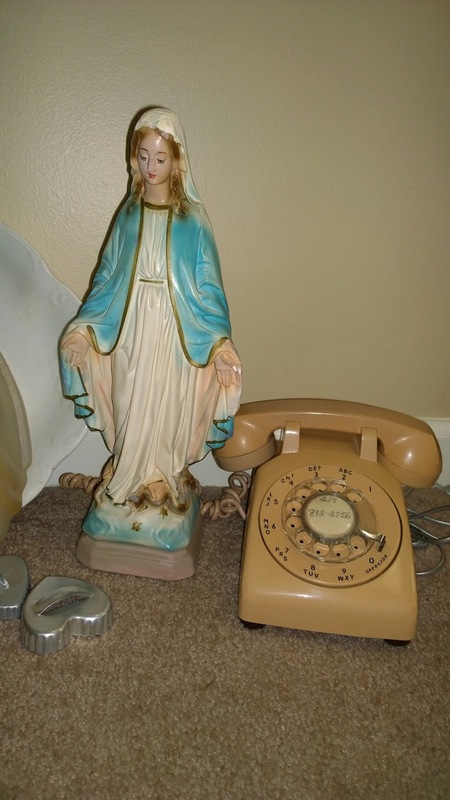 An old phone and a chalkware Virgin Mary. She was a little rough around the edges and had been touched up in a couple of spots, but I knew she had potential (I owe my knowledge on these to Gina). 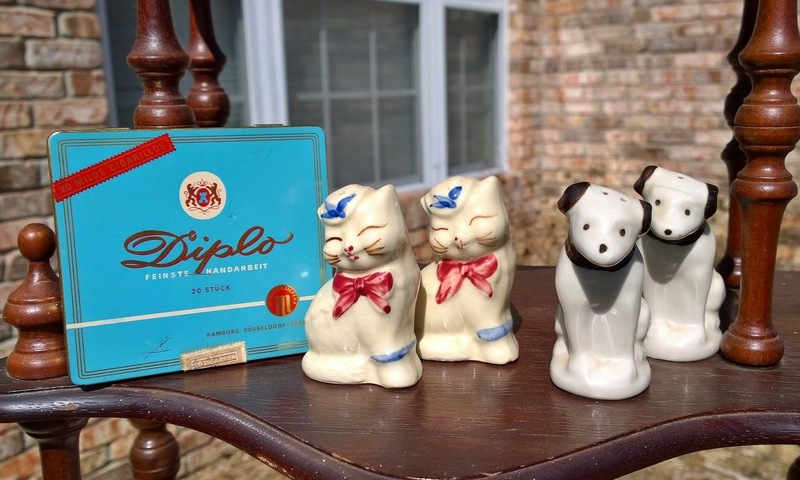 A weirdo clippy thing that I will use to display postcards or pictures, a lard tin, an Old Spice shaving mug, an ironstone platter, 2 art deco light covers, 2 floral frogs, and 2 cookie cutters. 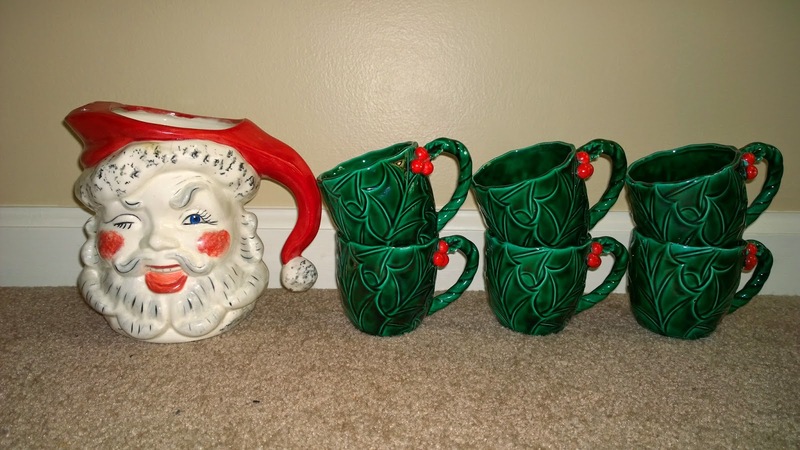 The holiday finds were this (hand made) Santa face pitcher that will match all my mugs and these Lefton holly berry mugs. Well, that's it for the finds, which brings me back to my original question: how am I going to top last week? And then it hit me. I owe you guys a giveaway! Follow my blog and leave me a comment telling me what platform you follow me on. Example: I follow you on Bloglovin'! Follow me on Facebook (from your personal page) and leave me another comment telling me that you do. This will guarantee you 2 entries. For an extra 3 entries write about this giveaway on your blog and leave a comment with a link to the post. This giveaway is open to the US and Canada until Friday. I will contact the winner next weekend by email. GOOD LUCK! 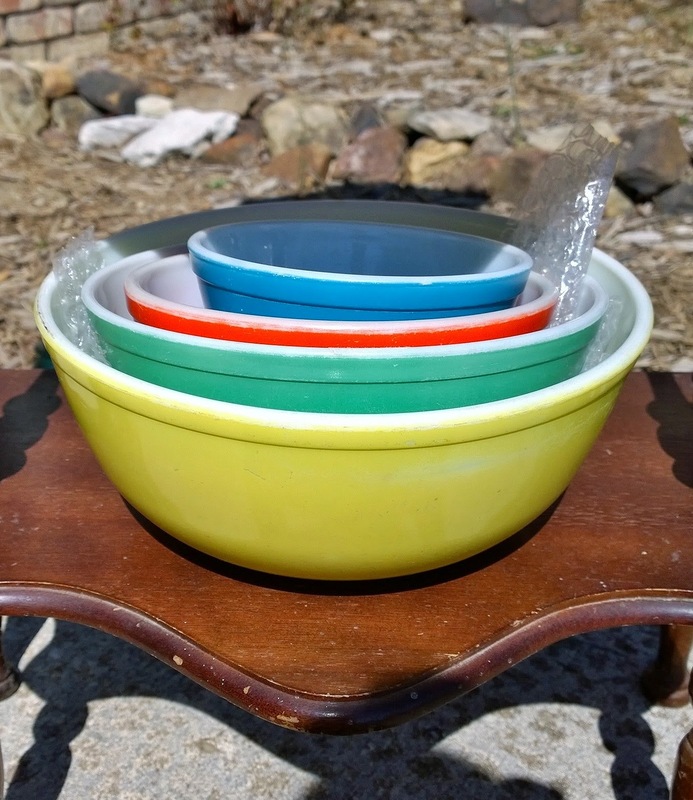 Garage Sale Season Has Started With a Bang!